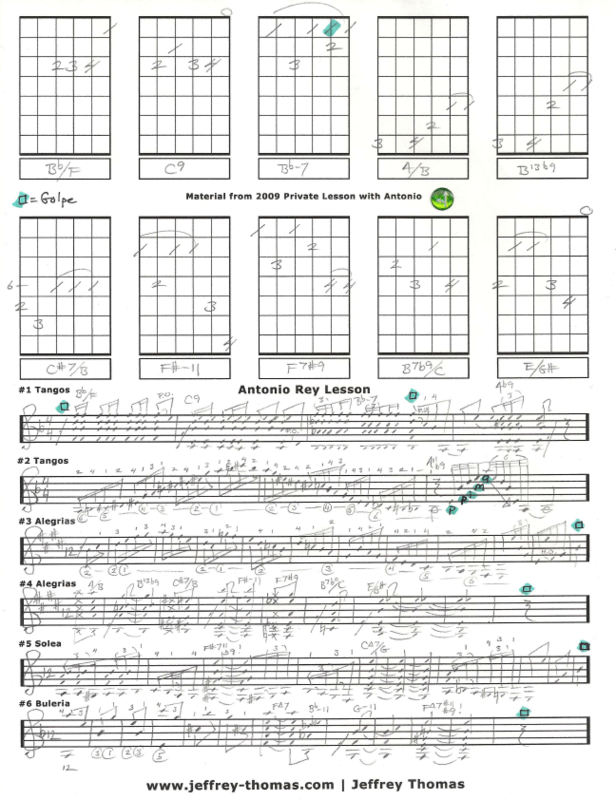 Antonio Rey free flamenco guitar lesson with video and tab. Ole Antonio! Here are some falseta ideas from my private study with Mr. Rey. 2 Tangos, 2 Alegrias, 1 Solea and 1 Bulerias. I have done my best to notate as much detail as possible and make sure you watch the free video following the notation here: (Antonio Rey Flamenco Guitar Lesson). The lesson handwritten in standard notation so watching the video will be very helpful. Flamenco guitar is one of the most challenging styles to play and I would be happy to work with students who are interested in learning the style. Want the guitar tab for free? Just send in your email address using the form provided. Looking for online flamenco guitar lessons? Fill out the Schedule A Free Lesson form to set up a free Skype guitar lesson today. Antonio is simply one of the best flamenco guitarist alive today. Check out his CD’s and if you get a chance to see him live go! Please check out my online guitar video lesson archive for more cool, unique free video guitar lessons.